"Three Shirts to the Wind" - Murphy and the team weigh the pros and cons of accepting the offer to have the first interview with a headline-grabbing former White House senior advisor (David Costabile) who wants to promote his divisive book and agenda on "Murphy in the Morning." Also, on his own program, Avery moderates a lively political discussion with locals in Buffalo, N.Y., on MURPHY BROWN, Thursday, Oct. 18 (9:30-10:00 PM, ET/PT) on the CBS Television Network. 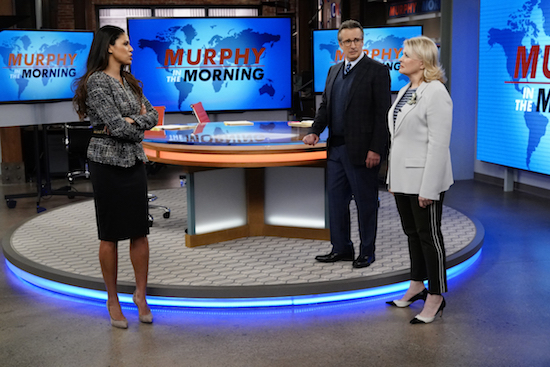 Pictured L-R: Merle Dandridge as Diana Macomber, Grant Shaud as Miles Silverberg, and Candice Bergen as Murphy Brown Photo: John Paul Filo/CBS ÃÂ©2018 CBS Broadcasting Inc. All Rights Reserved.